We're all about sharing the blog world love here at Fit-Ink. Without some of our favorite reads online--half of which we probably still have to share with you all as it's been a busy month now that the weather's getting nice--we'd be a fledgling idea with nowhere to go and simply something that Liz and I would talk about over e-mail or during bike rides (which we're hoping to start up again soon, if I could get over my fear of taking my bike out for the first ride of the season). And we like to think there'd be no Fit-Ink without some blogs preceding us in cyberspace--and we hope we're not stepping on any toes with content and such. Anyway, one of these inspirations that proved to us that starting Fit-Ink was indeed possible is celebrating a birthday this week--Fit Bottomed Girls. We met one of the gals behind Fit Bottomed Girls last October while at the Nike campus for the launch of the Sister series shoes and some cool new women's training gear. By chance, I shared a ride to the airport with Erin from FBG, learned about their start, and by the time I was boarding my plane back to Chicago, I was convinced that our ideas had to move beyond paper. 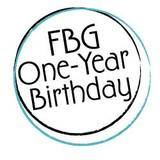 But the cool part is that the Fit Bottomed Girls are celebrating their one-year birthday this week. Yay and congratulations! And the best part is one that we can all benefit from. To celebrate their site they're offering some great giveaways all week long, and some fun posts to look back on their first year. Check out the schedule for the week and try to score some of the awesome fit items. I'm gunning for the TRX system--I tried it at a class earlier this month (stay tuned for a write-up in the June issue of Windy City Sports if you're in the Chicago area) and was hooked. And if I could win it...I'm all for freebies as I've hinted or stated before. Post: What Would You Like to See More of?